Alison P.W. 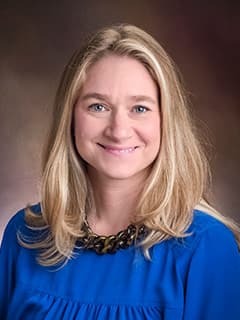 LaBadie, MD, FAAP, is an attending neonatologist at CHOP Newborn Care at Holy Redeemer Hospital. Nance ML, Polk-Williams A, Collins MW, Wiebe DJ. Neurocognitive Evaluation of Mild Traumatic Brain Injury in the Hospitalized Pediatric Population. Annals of Surgery, 2009 May; 249(5): 859-63. Polk-Williams A, Carr B, Blinman TA, Masiakos PT, Wiebe DJ, Nance ML. Cervival Spine Injury in Young Children: A National Trauma Databank Review. Journal of Pediatric Surgery, 2008 Sep; 43(9): 1718:21. Quinones Cardona V., LaBadie A, Cooperberg D, Zubrow A, Touch S. Implementation of I-PASS in the Neonatal Intensive Care Unit (NICU): Improving the Handoff Process. American Academy of Pediatrics, National Conference and Exhibition, Chicago, IL. September 2017. Quinones Cardona V, LaBadie A, Cooperberg D, Zubrow A, Touch S. Implementation of I-PASS in the Neonatal Intensive Care Unit (NICU): Improving the Handoff Process. Pediatric Academic Societies, San Francisco, CA. May 2017. LaBadie A, Quinones Cardona V, May-Rabbach J, Zubrow A, Touch S. Needs Assessment and Development of a Standardized Neonatal Intensive Care Unit (NICU Handoff: NICU I-PASS Curriculum. Pediatric Academic Societies, San Francisco, CA. May 2017. Quinones Cardona V, LaBadie A, Cooperberg D, Zubrow A, Touch S. Implementation of I-PASS in the Neonatal Intensive Care Unit (NICU): Improving the Handoff Press, St. Christopher’s Hospital for Children Research Day, Philadelphia, PA. June 2017. LaBadie A, Quinones Cardona V, May-Rabbach J, Zubrow A, Touch S. Needs Assessment and Development of a Standardized Neonatal Intensive Care Unit (NICU) Handoff. NICU I-PASS Curriculum. St. Christopher’s Hospital for Children Research Day, Philadelphia, PA. June 2017. LaBadie A, Quinones Cardona V, May-Rabbach J, Zubrow A, Touch S. Needs Assessment and Development of a Standardized Neonatal Intensive Care Unit (NICU) Handoff: NICU I-PASS Curriculum. Eastern Society for Pediatric Research Annual Meeting, Philadelphia, PA. March 2017. Quinones Cardona V, LaBodie A, Cooperberg D, Zubrow A, Touch S. Implementation of I-PASS in the Neonatal Intensive Care Unit (NICU): Improving the Handoff Process. Eastern Society for Pediatric Research Annual Meeting, Philadelphia, PA. March 2017. LaBodie A. Spontaneous Pneumothorax. Subgaleal Hemorrhage After Vacuum-Assisted Vaginal Delivery. Obstetrics and Gynecology/Neonatology Morbidity and Mortality Conference, Hahnemann University Hospital, Philadelphia, PA. 2016.